Allowing you to prepare your favourite meals quickly and easily, our fantastic range of Hotpoint microwaves have been expertly developed to fit into all kitchens. Boasting a number of flexible, contemporary and innovative features including multiple programming options, easy clean enamel interiors, outstanding power, steam cooking and hot air frying, there’s no denying that a Hotpoint microwave will be a welcomed addition to your kitchen. 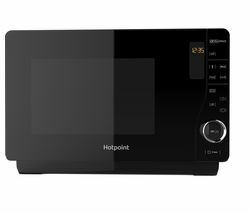 Within our product range, you will find a great choice of performance focused microwaves including the Hotpoint Ultimate MWH 33343 B Combination Microwave – Black. 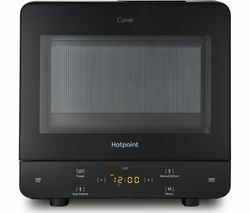 Featuring multi-wave technology that is ideal for quick cooking, dynamic defrost functionality that has been designed to protect your food while defrosting, steam and boil functions that are ideal for adding a new and exciting dimension to meal times, as well as a number of intelligent cooking programs that allow you select the right function for the meal you're cooking, this Hotpoint microwave really does have it all. Above all, it’s this microwave’s multi-wave technology that really sets it apart. With its two emission plates, you will be able to heat and cook your favourite dishes quickly and evenly as the heat is fully distributed throughout the cavity as you're microwaving. This means that there won't be any cold patches in your food. All microwaves in this range have also been developed to stand the test of time in even the busiest of households. And if you’re in the midst of updating your kitchen appliances, don’t forget that we also provide a whole host of other kitchen electrical products including ovens, microwaves and toasters from some of the industry’s leading brand names such as Indesit, Logik, Smeg and Sharp.